A recent development was a reminder of efforts by both sides to forge greater cooperation in this realm. The Indian and Indonesian navies have just begun their 33rd coordinated patrol exercise from the Andaman and Nicobar Islands, and it will go on until April 4. The exercise includes the Indonesian Naval Ship KRI Sultan Thaha Syaifuddin and Maritime Patrol Aircraft CN-235, along with Indian vessels and aircrafts, with the two militaries undertaking patrolling on their respective sides of the 236 nautical miles long International Maritime Boundary line. Simultaneously, the Indian Coast Guard ship INS Vijit is undertaking a four-day visit to the Indonesian port of Sabang in a further demonstration of the increasingly close maritime collaboration. 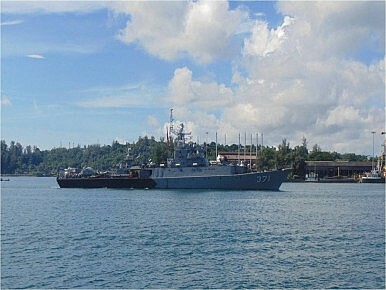 India’s growing involvement in Sabang port has been seen over the past year – last July, another Indian naval ship, INS Sumitra, had also visited Sabang. These developments underscore the close maritime cooperation between the two countries over the past few years, and their widening defense relationship more generally. While the close relationship between the two countries in some senses is not new – they were both champions of the Non-Alignment Movement (NAM) in the 1950s for instance – strategic alignment had been far from clear, and the defense aspect of that has only begun to take off more in recent times. That should come as no surprise. For one, generally, under Prime Minister Narendra Modi, India has began to pay more strategic attention to Southeast Asia in general and the Association of Southeast Asian Nations in particular, and Indonesia is a vital part of that. Last June, Prime Minister Narendra Modi had travelled to Indonesia as part of this three-nation trip to Southeast Asia giving a big push to India’s Act East Policy. For another, as this process has been underway, both countries have interests that are aligned somewhat in terms of addressing the rise of China and making advances in the maritime domain. This comes amid the rising conversation about the Indo-Pacific, with Indonesia hosting a meeting on the subject this week. As a result, it is no coincidence that we continue to see defense-related and maritime-related developments continue to take shape between India and Indonesia. To take just one example, there has been an agreement signed between the two countries to advance economic engagements between Andaman and Nicobar Islands and Aceh and North Sumatra Province. This agreement envisions joint development of the region to promote cruise and eco-tourism, start air transport linkages by introducing commercial flights between Indonesia and Port Blair, and sea transportation connectivity in the form of RoRo vessel shipping to facilitate trade between the two regions. These have the potential to create a constituency on both sides that could propel the economic aspects of the bilateral relationship. In another example, in order to push the economic relationship between the two sides, Indonesia just hosted the 2nd India Indonesia Infrastructure Forum (IIIF). The first such Forum between the two sides was held last year with elaborate plans for regional connectivity in terms of economy, infrastructure and energy links. India has also agreed to join hands with Indonesia in developing a deep-sea port in Sabang. The port will clearly give India a bigger foothold in the region while enhancing the maritime links between India and Southeast Asia. The strategic imperatives as well as new developments at play in the India-Indonesia relationship suggest that we are likely to see the two sides continue to grow closer in the coming years. But at the same time, expectations about this new partnership must be tempered with reality. There are no shortage of challenges as well, including New Delhi’s continued lack of nuanced understanding on how Southeast Asian nations like Indonesia operate as well as India’s own changes in its China policy in the face of complications. These serve as important reminders that even though there are larger strategic interests binding them together, there are also limitations. What’s Next for India-Indonesia Defense Ties? Both sides continue to attempt to make progress in this aspect of security ties despite the challenges that remain.